organised into two main stages. Firstly, a literature review on KM and its usage in small business has been carried out. Secondly, the outcome of the literature review allowed to set-up a semi-structured questionnaire that has been validated in a number of focus group discussions involving SMEs’ managers, academics and consultants. The paper is organised into seven sections. Following this introduction, a literature review on KM (section 2) and KM in small businesses (section 3) is provided. Section 4 describes the context of investigation, while the methodology used is detailed in section 5. The main findings emerging from the empirical survey are presented in section 6. Conclusions and recommendations are outlined in section 7.
c) to build a knowledge infrastructure-not only a technical system, but a web of connections among people given space, time, tools, and encouragement to interact and collaborate. Bhatt, (2001) defined KM identifying the different phases in which a KM project may be organised. In fact, the author defined KM as a process of knowledge creation, validation, presentation, distribution, and application. These five phases in knowledge management allow an organization to learn, reflect, and unlearn and relearn, usually considered essential for building, maintaining, and replenishing of core-competencies In a broad sense, Quintas et al. (1997) define knowledge management as the process of continually managing knowledge of all kinds to meet existing and emerging needs, to identify and exploit existing and acquired knowledge assets and to develop new opportunities. Interestingly, the author pointed out that KM refers to the management of all kind of knowledge, but only for developing new opportunities. However, the KM definition suggested by Iandoli and Zollo (2007) has been considered the working definition for this paper as it simultaneously refers to objectives, knowledge involved, tools and phases of KM. According to this definition: “KM is the process of creating, capturing, and using knowledge to enhance organisational performance. It refers to a range of practices and techniques used by organisations to identify, represent, and distribute knowledge, know-how, expertise, intellectual capital, and other forms of knowledge for leverage, reuse and transfer of knowledge and learning across the organisation”. As illustrated above, KM initiatives involve not only an implementation of ICT but also social and cultural facets. However, while ICT does not apply to all of the issues of knowledge management, it can support KM in different ways. In this sense, according to Alavi and Leidner, (2001), knowledge management systems (KMS) refer to a class of information systems applied to managing organizational knowledge. That is, they are IT-based systems developed to support and enhance the organizational processes of knowledge creation, storage/retrieval, transfer, and application. 3. the institutional and policy framework that is intended to support knowledge production within SMEs. in SMEs there is lack of explicit knowledge repositories. Instead, each manager/owner acts as the knowledge repository. Common knowledge possessed by members of the SMEs is deep and broad. This common knowledge helps in the organization of work by easing issues of knowledge transfer, sensemaking, and application. SMEs by their nature and due to deliberate mechanisms are skilled at avoiding pitfalls of knowledge loss. The close social ties between members of the SME act as a deterrence against employees leaving the business. In cases where employees do leave the business, there are plenty of available knowledge resources that can be mobilized to quickly fill the void. SMEs have a knack for exploiting foreign sources of knowledge. Since they are resource constrained, and cannot spend efforts to create knowledge, they look outside the organization for knowledge. SMEs knowingly or unknowingly, manage knowledge the right way – the humanistic way. Technology is never made part of the knowledge management equation. The use of technology in an SME is mostly limited to acts of automation (such as the use of cash registers) and at times for informative purposes (storing of employee contact information in databases). the knowledge and organizational learning processes in SMEs. The above set of critical success factors is important because of it can act as a list of items for SMEs to address and deal with when accomplishing KM. This helps to ensure that essential issues and factors are covered when small firms are planning and developing a KM strategy. It can also provide a basis for them to evaluate their KM practices (Wong, 2005). Table 2 shows that ENS the most part of firms operates in the aerospace and ICT sectors. Euro.Soft Intecs ITS Kell Naosys Null Pointer SRSe Form & ATP Mater Protom Tecno-In Ansaldo S.F. Lead Tech Canale Otto S.p.A. It is worth to outline the working mechanisms of ENS. On the basis of a specific market opportunity, a firm proposes a project and it launches a call for adhesion. The firms that joint the project create a network inside ENS. They select a coordinator and develop the project. In this way, ENS is characterised by a set of peer temporary relationships orientated to specific projects. It is a dynamic network in which project collaboration relationships are continuously formed and reformed. 5. Methodology After the literature review, a questionnaire survey has been conducted. The main aim of the survey is to shed light on the most relevant features characterising the usage of KM in ENS firms. The survey methodology has been organised into the following five steps: a) Definition of basic survey objectives and preparation of the draft questionnaire. In this phase a draft version of the questionnaire has been prepared together with the basic survey objectives. b) Establishment of focus groups. In order to test the suitability of the basic survey objectives and comprehensibility of the draft questionnaire a focus group involving 8 experts with different competence and professional background was established. The focus group has been developed in three different phases. Firstly, the topic investigated has been presented in order to make focus group participants familiar with it. Secondly, the draft questionnaire has been submitted to the panellists in order to get their useful feedback and comments. Finally, panellistsâ&#x20AC;&#x2122; remarks have been discussed in a plenary session. c) Re-focussing of survey objectives and questionnaire. On the basis of feedback received during the focus group discussion, the questionnaire has been finalised. Most of the questions included in the questionnaire are based on a Likert scale ranging from 1 to 9. Some other questions allow more qualitative answer in order to allow respondents to express their own personal opinion. d) Test of the questionnaire. In this step, the final version of the questionnaire has been tested through 3 pilot interviews carried out in ENS firms. e) Survey implementation. The survey has been conducted in spring 2008. The total number of respondents is 18 out of 25 companies with a response rate of 72%. The questionnaire has been submitted during face-to-face interviews involving at least two managers with different skills and role (e.g. a manager involved in the strategic firm decisions making process and a manger involved in the operation management). This allowed obtaining both strategic and operational perspectives. In order to have a more comprehensive picture of the East Naples high-tech enterprise system, information from complementary sources (e.g. company websites, company reports and industry magazines) have been collected and analysed. implementation (see figure 2). The most widespread forms of KMS implementation are through the Internet website and work teams. In fact these are relatively simple tools that fit the needs of managing knowledge inside small firms. The high importance attached to work teams also suggests that, in high technology sectors, in addition to ICT, interactions and interpersonal relationships are a fundamental tool for exchanging and sharing knowledge, as suggested by the literature. Figure 2: Tools for KMS implementation Nevertheless, advanced and structured KMS equipped with a document management system, data mining, and decision support systems are rarely used. These tools are more suitable for the implementation of external and internal KMSs as they support knowledge management both inside and outside the firms. Although only 4 firms use internal and external KMS, almost all firm investigated claimed for wider KMSs to support project collaboration relationships. These systems enable KM practices not only inside a single firm, but also among firms involved in a common project that continuously need to exchange and share critical knowledge. For this reason, the benefits of a KMS enabling project collaboration relationships have been analysed (see figure 3). In the figure the average value of importance for each expected benefit is reported. The figure interestingly shows that internal and external KMSs may have a positive impact not only on the innovation and the operational management, but also on the identification of the market opportunities. These features further clarify the potential support that internal and external KMSs can provide to support project collaboration relationships. In fact, the exploitation of market and innovation opportunities are the main aim of the common projects carried out by ENS firms. In this context, operational management is a fundamental tool that allows projects to be implemented effectively. However, a number of barriers to KMSs implementation have been indicated (see figure 4). Interestingly, technological barriers and tacit nature of knowledge exchanged are the less relevant barriers. This may be explained considering that in the SMEs context, work teams allow sharing informal knowledge. Nevertheless, the unavailability of partners to share knowledge and the need to protect critical information are the most relevant barriers. This suggests that SMEs investigated seem oriented to preserve their own intellectual assets from the possible opportunist behaviour of potential partners. Figure 4: KMS implementation barriers Another aspect investigated relates to information that companies are willing to share through the adoption of a KM platform as shown in figure 5. This platform may assume the structure of a complex knowledge base in which ENS firms involved in different projects may share critical information. assumes a critical importance in new product/service development, information of this kind are critical to be shared. Another interesting issue concerns the human resources management. In fact, as shown in the above figure, a KM platform can provide useful tools both in recruiting and training employees and new staff. Finally, ENS firms show a low interest in sharing information about management control systems, administrative issues and quality management. This may be explained considering that these information are generally firm specific and they don’t need to be shared for the effectively development of common projects. Management of market knowledge. KMS may support relationships with customers in order to facilitate both the exchange of relevant information and improving communication with them. Furthermore, a KMS should support the retrieval of information about market opportunities. Management of technology knowledge. This is a critical area for firms operating in high technology sectors. KM tools should support the circulation of critical information about know-how and technology. In the ENS context this appears particularly important as firms participate in collaborative projects aimed at developing new products and services. Practical examples may be the virtual sharing of design tools (e.g. or CAD, CAE e CAM) and management and control systems (e.g. MRP and ERP) related to the same project. Management of relational knowledge. In developing and managing collaborative projects it is important to have in place tools facilitating the collaboration among participants. Nevertheless, the adoption of these tools may be inhibited by the need to protect intellectual assets and cultural barriers. The ultimate goal of KMS in SME networks context should be to achieve an appropriate balance between individual needs and project partnership. References Alavi, M. and Dorothy E. L. (2001) “Review: Knowledge Management and Knowledge Management Systems: Conceptual Foundations and Research Issues”, MIS Quarterly, Vol. 25, No. 1, pp 107-136. Bhatt, G. D. (2001) “Knowledge Management in Organizations: Examining the Interaction Between Technologies, Techniques, and People”, Journal of Knowledge Management, Vol. 5, No. 1, pp 68-75. Davenport, T.H. and Prusak, L. (1998) Working Knowledge: How Organizations Manage What They Know, Harvard Business School Press, Boston. Desouza, K. C. and Awazu, Y. (2006) “Knowledge Management at SMEs: Five Peculiarities”, Journal of Knowledge Management, Vol. 10, No. 1, pp 32-43. Drucker, P.F. (1993) The Post Capitalist Society, Butterworth-Heinemann, London. Earl, M. (2001) “Knowledge Management Strategies: Toward a Taxonomy”, Journal of Management Information Systems, \/ol. 18, No. 1, pp 215-233. Egbu, C.O., Hari, S. and Renukappa, S.H. (2005) “Knowledge Management for Sustainable Competitiveness in Small and Medium Surveying Practices”, Structural Survey, Vol. 23, No. 1, pp 7-21. European Commission (2005) The New SME Definition. User Guide and Model Declaration, European Commission, DG Enterprise & Industry, Bruxelles. Finkl, K. and Ploder, C. (2009) “Knowledge Management Toolkit for SMEs”, International Journal of Knowledge Management, Vol. 5, No. 1, pp 46-60. Frey, R.S. (2001) “Knowledge Management, Proposal Development, and Small Businesses”, The Journal of Management Development, Vol. 20, No. 1, pp 38-54. Herrmann, T., Herrmann, G.B., Jahnke, I. (2007) “Work Process Oriented Introduction of Knowledge Management: Reconsidering the Guidelines for SME”, In: Tochtermann, K.; Maurer, H.: I-KNOW ’07. 7th International Conference on Knowledge Management. Graz (Austria): Know-Center. Iandoli, L. and Zollo, G. (2007) Organizational Cognition and Learning. Building Systems for the Learning Organization, Information Science Publishing, New York. McAdam, R. and Reid, R. (2001) “SMEs and Large Organisation Perceptions of Knowledge Management: Comparisons and Contrasts”, Journal of Knowledge Management, Vol. 5, No. 3, pp 231-241. Nolan Norton Institute (1998) "Putting the Knowing Organization to Value," White Paper. Nonaka, I. (1994) "A Dynamic Theory of Organizational Knowledge Creation," Organization Science, Vol. 5, No. 1, February, pp 14-37. Nonaka, I. and Takeuchi, H. (1995) The Knowledge- Creating Company, Oxford University Press, New York. Omerzel, D.G. and Antoncic, B. (2008) “Critical Entrepreneur Knowledge Dimensions for the SME Performance”, Industrial Management & Data Systems, Vol. 108, No. 9, pp. 1182-1199. Pillania, R.K. (2006) “Leveraging Knowledge for Sustainable Competitiveness in SMEs”, International Journal of Globalisation and Small Business, Vol. 1, No. 4, pp 393-406. Pillania, R.K. (2008) “Strategic Issues in Knowledge Management in Small and Medium Enterprises”, Knowledge Management Research & Practice, Vol. 6, pp 334-338. Polanyi, M. (1962) Personal Knowledge: Toward a Post- Critical Philosophy, Harper Torchbooks, New York. Polanyi, M. (1967) The Tacit Dimension, Routledge and Keoan Paul, London. Quintas, P., Lefrere, P. and Jones, G. (1997) “Knowledge Management: a Strategic Agenda”, Long Range Planning, Vol. 30, No. 3, pp 385-391. Sparrow, J. (2001) “Knowledge Management in Small Firms”, Knowledge and Process Management, Vol. 8, No 1, pp 3–16. Sveiby, K. (1997) The New Organizational Wealth: Managing and Measuring Knowledge-Based Assets, Berret Koehler, San Francisco. Thorpe, R., Holt, R., Macpherson, A. and Pittaway, L. (2005) “Using Knowledge within Small and Medium-Sized Firms: A systematic Review of the Evidence”, International Journal of Management Reviews, Vol. 7, No. 4, pp 257–281. 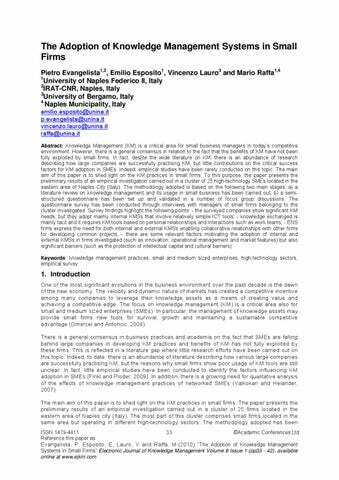 Valkokari, K. and Helander, N. (2007) “Knowledge Management in Different Types of Strategic SME Networks”, Management Research News, Vol. 30, No. 8, pp 597-608. Wiig, K. (1993) Knowledge Management Foundations, Schema Press, Harlington. Wong, K. Y. (2005) “Critical Success Factors for Implementing Knowledge Management in Small and Medium Enterprises”, Industrial Management & Data Systems, Vol. 105, No. 3, pp 261-279. Wong, K.Y. and Aspinwall, E. (2005) “An Empirical Study of the Important Factors for Knowledge-Management Adoption in the SME Sector”, Journal of Knowledge Management, Vol. 9, No. 3, pp 64-82. 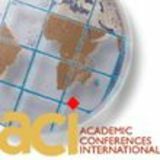 Zack, M. (1998) "What Knowledge-Problems Can Information Technology Help to Solve," in Pro-ceedings of the Fourth Americas Conference on Information Systems, E. Hoadley and I. Ben-Basat (eds. ), Baltimore, MD, August, pp. 644-646.